Cocktail competition season is in high gear, and I wanted to report some of the achievements of the fine mixologists in Chicago. The photos are from the cocktail competition held last night for Right Gin, in their private loft here in Chicago. Charles Joly, of the Drawing Room, won last night's competition, and will be going to San Francisco later this year. He also won $500, for his twist on a classic Julep using Right Gin and a little absinthe. Congrats Charles! DJ Love from Le Bar at the Sofitel, who won the Illinois WCC finals last month, won the silver in the national competition last week. Well done DJ! Adam Seger from Nacional 27, was just announced as a finalist in the Buddy are Your Bitters Better? competition at Tales of the Cocktail this year. Congrats Adam! Tim Lacey and Cristi DeLucca from the Drawing Room made it to the finals of the USBG Caipirinha Competition to be held at Tales. Good luck Tim and Cristi! Kyle McHugh from Drinks Over Dearborn and Mike Ryan from The Violet Hour were selected as cocktail apprentices for this year's Tales of the Cocktail. Congrats Kyle and Mike! I have undoubtedly forgotten to mention something, please chime in on the comment section if you know of one! This year's American Distilling Institute conference was a bit of a blur, and already a month has passed since I got home. Before any more time passes, here's a quick rundown of the conference. I wrote about this in another post. Suffice to say, it was a treat to see the stills and meet up with some of my blogger friends. After the bus ride back to the hotel (on which I was sampling one of Anchor's fine beers), I was exhausted. My car (with me in it) was rear-ended by a drunk driver the night before (a bit ironic, since I was leaving my distillery), and I only got about 30 minutes of sleep before my flight that morning. So I went to the restaurant across the street for dinner and called it a night. We convened at St. George Spirits at a fairly early hour, and followed along on a schedule of sessions on a variety of topics. This year's theme was brandy/eau de vie/grappa, so the presentations were about distilling spirits from fruit. We heard from many great craft spirit producers, including Dan Faber from Osocalis and Hubert Germain-Robin. We also had a panel session on marketing craft spirits, and lobbying legislators for changes to arcane state liquor laws that many of us confront. Awards were also given out in a variety of categories, and we had an opportunity to taste the entered spirits. We didn't enter anything, since we don't have anything out from fruit (yet). That night, I had both bad and good tiki experiences - more on that here. For the first time at one of these ADI conferences, we had a public tasting event. This was a welcome addition to the conference, and provided many of us a great opportunity to interact with consumers in the Bay Area about our products. Members of the general public were invited to come out to St. George and try spirits from all the distilleries present, and in most cases, meet the distiller/founder. We had a pretty good turnout, and it was a lot of fun. I hope to see more of these types of events at future conferences, ideally with more publicity to increase the interest & turnout, but this was a great start. The only beef I had with the event, which I voiced to the powers that be, was that there were some products that do not meet my definition of American craft spirits, so I wouldn't have allowed them to be poured. For instance, there were some imported spirits. At any rate, we went on a proper cocktail crawl on Sunday night in San Francisco - more on that in a post coming soon. On Monday, Bay Area bartenders and mixologists were invited to come out and taste spirits and talk with the distillers/founders. Unfortunately, the turnout was fairly light, but this was also a fun event and a good idea. As my friend Gabriel over at Cocktail Nerd noted, bartenders and mixologists are an essential partner for small distilleries. One of the highlights for me was to meet some of my blogging friends. It was fantastic to have them at the conference, and I was very happy they were invited to participate and write about our group and our industry. The folks at St. George were wonderful hosts, and a lot of fun too. Thank you to Jorg, Lance, Andie and the rest of the team at St. George for hosting us and letting us invade their distillery for three days! Well, so far, I'm about 3 for 5 on the Mixology Mondays for the year, despite my New Years resolution. This month, our host is Chuck Taggart over the Gumbo Pages, home to tons of great stuff (and my main source for restaurant recommendations in New Orleans at Tales last year). Our theme this month is Amaro, and Chuck advises this "refers to the bitter liqueurs usually drunk as an after-meal digestive, either alone (neat or on the rocks) or in some kind of mixed drink or cocktail...wherever somebody drinks a bitter liqueur, that's a source for your drink this month." I figured this was a perfect opportunity to open up that bottle of Amer Picon that I conned one of my former coworkers into dragging back from Paris for me awhile back. Derek and I had been in Paris, and I tried a "Picon Biere," which was essentially a pilsener with a shot of Amer Picon in it. I happened to like the drink, while Derek despised it. Then when we got home, I read up on Amer Picon a little, and figured I ought to get my own bottle. Unfortunately, I wasn't going to Paris anytime soon, but my friend Bill was. Bill dragged it home for me, and there it sat. For awhile. Guess I got distracted, or read these about how this version is a shadow of the pre-1970's version, or I was focusing on other spirits, or whatever, but I found it again a couple of months ago and vowed to open it soon. Plus, I picked up a bottle of Torani Amer when I was in San Francisco last month, so I wanted to taste them side-by-side. Amer Picon appears in many old cocktail books, although it disappeared from the US market a long time ago and is difficult to find except in parts of France. It's a bitter (and sweet) liqueur, with orange notes. After some research, I determined that Amer Picon is now owned by Diageo, and there are actually two versions - Picon Biere (intended to be mixed with beer) and Picon Club (intended to be mixed with wine). The spirit goes back to 1837 according to their website, and they don't mention the formula change. I have the Club version, so I'll have to try it with wine sometime. For today, I tried a classic Picon cocktail with both versions of Amer. Pour Picon and grenadine over ice, top with soda nearly to the top. Stir briefly to chill. Top with a float of the brandy. Garnish with a lemon curl. With the Torani Amer, it is much more bitter and potent so I backed it down a little to my taste. The Torani has twice as much alcohol and stronger bitter notes. Both were very interesting, though, and I'll be experimenting more with them. I definitely want to try the Hoskins Cocktail that Chuck posted on his blog awhile back, and I found many others to try. Unfortunately, I am out of time if I want to meet the midnight deadline! As I mentioned a few days ago, the Hotel Monteleone is hosting a contest to develop a new signature Monteleone Cocktail. I've spent some time the last week or so playing with recipes, and I came up with one that I really like. I tried to think of something that was reminiscent of classic New Orleans cocktails and themes, but also unique. I didn't want it to be too trendy or faddish, lest it go out of style or an ingredient be no longer available, so I tried to stick to fairly standard ingredients with a twist. Stir all ingredients without ice first, to dissolve honey and intermix with other ingredients. Add ice, shake well, and strain into chilled coupe glass. Garnish with flamed orange peel. 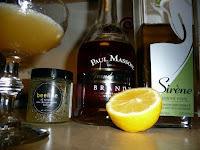 I used very basic brandy, but also tried it with some others and some basic-level cognacs. As long as the brandy is well-balanced and smooth, it seems to work well. The honey is very important - it should be fairly standard honey, nothing too fancy or flavorful. I did try a lavender honey, and it was an interesting variation, but I liked standard clover honey best. 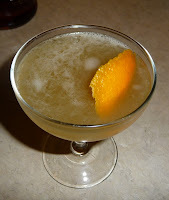 I used our absinthe, but I think it would work with others that are more widely available, as long as it has a traditional flavor profile and is not overwhelmingly bitter. Cheers to the Hotel Monteleone and the contest winner, I look forward to having one of the winning drinks at Tales of the Cocktail in July! The 2009 American Distilling Institute conference was held in Alameda, CA last month, at St. George Spirits (more on the conference in a future post). The folks at St. George were wonderful hosts, and provided a great location for our conference. Since we're distributing in Northern California now, I figured it made sense to go to the conference and then spend some time with our distributor's folks in San Francisco. In addition to the public tasting event for craft spirits, which was a terrific addition to the ADI conference, one of the highlights was getting to tour Anchor Distilling. Really? A Tour of Anchor? The first time I saw Fritz Maytag speak a few years ago at one of these conferences, I found it kind of comical. I have no doubt he is a wonderful man, and I'm sure we'd get along famously if we actually spoke face to face, but he was asked to speak to a group of new distillers and he revealed virtually nothing about anything he does at Anchor. I found myself wondering why he was speaking to us, given that he felt everything was a secret and wouldn't really tell us anything about what he was doing, or about his stills, etc. So when I heard we'd have a chance to not only visit his brewery facility, but also see the stills, I figured I had better be there. Funny enough, when he spoke to the group this time, Mr. Maytag admitted that historically he didn't even let all of his staff see the stills, let alone others in the industry or (gasp) members of the public. So at least he recognized he was "keeping everything close to the vest." Here are a few photos from the tour - it was a lot of fun. I only wish we could have tasted some of their spirits, rather than only the beers. They make some great beers, of course, many of which I can't get in Chicago, but they also make some spirits I can't get (e.g., the Hotalings). The Anchor uniform, which I loved. I think we should have a distillery uniform or something. So far, Derek's not going for it. I've been to no less than three Tiki bars in the last two months, more than I've visited in all my years until now. I still haven't made it to the Hala Kahiki, but I did get to the new Trader Vic's in Chicago, Forbidden Island in Alameda, CA, and the Conga Lounge in Oakland, CA. Seems like Tiki, along with classic cocktails, is having a bit of a resurgence perhaps? Or maybe I was just missing the boat until now. Tiki is a lesser-explored segment of the cocktail realm for me, but I've been trying to learn more about the culture, lore and drinks favored by my Tiki-crazy blogger friends. For some reason, we ended up here at the end of our St. Patty's day pub crawl. Perhaps it was because it was the only place we found without a huge line on a Saturday evening (and perhaps that was because it's not Irish). The decor is fantastic, and the menu has many favorite cocktails I've read about. We tried a few of them, but honestly my taste buds weren't at their best due to the beer and Irish whiskey consumed earlier in the day. We did enjoy the Pupu Platter (no longer called that) and the Tiki Puka Puka cocktail, but the Mai Tais were dyed green and too sweet. So were the crazy shots that our friend Maeve insisted on ordering for us. I gotta go back and give Trader Vic's another shot, and I'll post more about that when I do. I was hanging out with Melkon Khosrovian from Tru Spirits and Jonathan Forester from Penobscot Bay one night last month after a craft distilling conference, and we were trying to go and have dinner at one of our joint customers. Unfortunately, the place was tiny and also packed, with a 2 hour wait. So we wandered down the street and settled on pizza at Pizza Rustica. They didn't have any tables either, but said we could order pizza in their upstairs bar. So up we went. What we found when we went upstairs was a decked out Tiki Bar called the Conga Lounge - fun, with lots of great things to look at on the walls and hanging from above. The pizza was great, but unfortunately our drinks were not so great. We only had one drink each, and didn't even finish those. Darn, we wanted to like the place. Since I happened to be in Alameda, of course I had to go to Forbidden Island. Unfortunately, the legendary Martin Cate recently left, so I couldn't see him there, but I knew I had to go anyway. Every drink I tasted was great, and the ladies behind the bar were a blast. My favorite drink was the Sidewinder's Fang (pictured), although the Forbidden Island and Painkiller were both great too. Definitely have to go back next time I'm in the area. It was definitely fun to try some more Tiki drinks, I'll have to continue my explorations in Tiki. I'm behind on my blogging again, and am going to get caught up soon! In the meantime, I wanted to remind everyone to make plans now to attend Tales of the Cocktail this year - July 8-12, 2009 in New Orleans. The venue for Tales, Hotel Monteleone, is also celebrating a big anniversary and running a cocktail contest. The Hotel Monteleone is celebrating the 60th anniversary of the Carousel Bar (loads a .pdf) on May 21, 2009. From 1949 until about the late 60’s or 70’s there was a drink on the specialty drink menu called the Monteleone Cocktail. Unfortunately, we have no idea what the exact recipe or ingredients were. The Hotel Monteleone is hosting an online contest to accept drink recipe nominations for a new official Monteleone Cocktail. The recipes will be judged by VIPs who will be at the Carousel anniversary celebration on May 21. There are no requirements on types of liquor or style of drink, but all drink entries must be received by May 18, so that the ingredients may be acquired and drinks prepared at the May 21 event. Participating bloggers should post their entries online, and all participants should e-mail their drink recipes, along with their name, address and phone number, to athornton@hotelmonteleone.com. The winning entry will become the new official Monteleone Cocktail, and the winner will receive four free nights at the Hotel Monteleone during Tales of the Cocktail 2009. Get going - here's your chance to win a free stay at the Monteleone for Tales and be part of history!